Jesus' General: Who's going to watch my little towel shows, now? Who's going to watch my little towel shows, now? Gov. 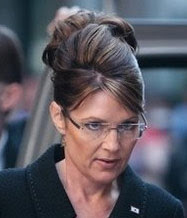 Palin agreed to do one last post for Jesus' General before taking a little time off. OK, it's over. We did our best; we fired you up and pressed all your buttons; but you failed to stop The Unholy One. That means I have to go back to freaking Alaska. No Saks! No Barney's! No Neiman Marcus! Just the freaking Wall-Mart in Walisa. So what am I going to do, now? A lot of you are asking me that. Well, first I need to tie up a few loose ends--like the clothing thing. During the campaign, I said I'd give it all back, all $150,000 $200,000 dollars worth of it. And I'll do that, except for the stuff I lost and the clothing the RNC bought Todd, Bristol, Piper, Willow, Trig, and Levi--I never made any promises about that. I have to get something out of this. Then, I'm going to have to find another way to get more money for clothes. I'm thinking about renting Trig out as a prop for candidates, pro-life activists, and subdivision developers. You've all seen how good he is at it. It's the special talent God gave him. Todd and I are also going to need to find new ways of spicing up our "happy minute." We won't have campaign advisers around anymore, so who am I going to tease with my little towel shows while Todd gets busy in his Brooks Brothers slacks? Hey, maybe we can get Joe the Plumber to move in with us. I bet he'd do it if I appointed him the Director of Fisheries. I wonder if he'd mind dressing up like a milkman on Tuesdays. Oh...or a puritan witch pricker! Mmmmmmmm. I like that! So that's about it, for now. Update: Country..continent...who cares? It's full of witches anyway!